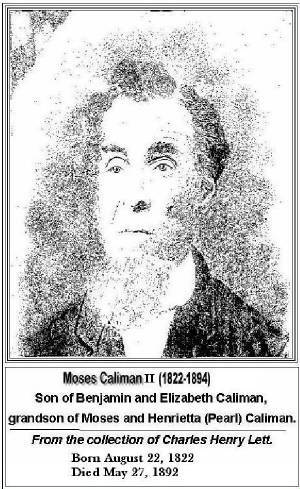 Moses Caliman I (1761- 1863) has been identified as a white man (records indicate that he moved to Maryland from New Jersey) and died in Muskingum County, Ohio on March 9th 1863. Henrietta Pearl Caliman (1768 - 1850), wife of Moses Caliman, was born in 1767 in Maryland and died in Muskingum County Ohio on October 24,1857. In the 1790 Federal Census of Maryland, Moses was listed as living next door to Thomas Pearl/Perrill (son of Robert Pearl alias Mulatto Robin Pearle). On January 4th 1809 in Winchester Va.. Moses Caliman paid a $150.00 bond so his daughter could marry Benjamin Lett. On January 5, 1809 Benjamin Lett married Mary 'Polly' Caliman in Frederick County, Virginia. Between 1817 and 1820 Moses Caliman migrated to Ohio from Frederick, Maryland. Moses & Henrietta Perrill/Pearl Caliman brought their three children, (who were listed as indentured servants), to Ohio. It is reported that Moses Caliman owned 900 acres of land in Muskingum County, Ohio. Mary 'Polly' Caliman: married Benjamin Lett (son of Samuel & Jemima Banneker Lett) on January 5 1809 in Frederick Co. Virginia. On January 4, 1809, the day before the wedding Moses Lett paid $150.00 bond in Winchester Virginia. The Letts and Calimans were free families. Elizabeth Caliman: married Elijah Lett (son of Samuel & Jemima Banneker Lett) in 1821, Harrison County Ohio. Their children were; Othias, Margaret, Emmanuel, Hestor. William, Elijah, Margaret and Melissa..
Phoebe W. Caliman: married Isaac Stevens (son of Michal Stephenson/Stephens/Stevens and Elizabeth Lett Stevens (daughter of Aquilla Lett). 1832. Ann Caliman married Amos Guy. Their children were James, Benjamin, William, Elijah, Amos Jr., Margaret and Elizabeth. Benjamin Caliman: married Elizabeth Perl/Perrill . Their children were; Benjamin Jr., John, Betsy and Peggy. * The Caliman family has had in its possession original land grant or deeds which were conveyed to Benjamin Caliman in 1830 and signed by President Andrew Jackson . (8th President of the United States. In addition they have another deed signed by Martin Van Burren (9th President of the United States). * Moses Caliman is believed to have been the first Lett Settlement Families to Settle in Meigs Township, Muskingum County, Ohio. * Benjamin Caliman, a son of Moses & Henrietta Pearl/Perrill Caliman had a distillery valued at $100.00. *A story is told about great grand-daddy Caliman: “Neighbors or customers would bring buckets or jugs for beverages to the Caliman farm. They would ask that Granny Caliman wait on them for she would always give them a sample or nip; Grand-daddy would not. * Moses Caliman who was born in 1761 died in Muskingum County Ohio on the 9th day of March in 1863. He was on that day visiting at the home of Othias Lett who was his nephew. “The history of the Caliman Family” - copied by Wayman G. Caliman in 1931. Research provided by Peter Byrd at the Lett Settlement Reunion in 2006. Information provided by Charles H. Lett, as told by Alvah Caliman, and provided in a leaflet prepared by Charles J. Weiker at the Lett Settlement Families Reunion in 2003. Pearls/Perrills of Pennsylvania, descendants of Lawrence Perrill believe that James Cranford, who died when struck by lightning in 1699 at Calvert County, Maryland, is Robert Pearl’s father with an unknown slave mother. Robert "Mulatto Robyn" Pearl (1686-1765) & Ann Jarvis (unconfirmed) of Baltimore and Frederick Count, Maryland are likely the paternal grandparents of Henrietta Pearl/Perrill by her unknown Pearl/Perrill father. Duplicated generational names increase the difficulties of identifying paternity of Maryland, Pennsylvania and Virginia Pearls/Perrills. John Calliman (1746-1830) & unknown woman are parents of Moses Caliman. Unknown Pearl/Perrill parents of Henrietta but likely her father was a son of Robert Pearl of Frederick, MD. Amos Guy & unknown woman are parents of James A. "Grandfather" Guy, Sr.
James A. "Grandfather" Guy, Sr. (1772-1866) & Deborah Ridgeley (1777-1842) are the parents of Amos C. Guy, who married Ann Caliman and were the parents of Henrietta Guy and Lydia Guy who married Charles M. Brown, the parents of James G. Brown. Amos C Guy (1810-) & Ann Caliman (1813-) are the parents of Henrietta Guy. Charles M. Brown (1801-) & Lydia Guy (1807-1845) are the parents of James G. Brown. Andrew Thomas Dingus (1846-1886) & Malinda Winston (1858-1910) are the parents of James Andrew Dingus. Andrew Dingus’ mother was Rhoda, the daughter of Charles Anderson Dingess (b. 1774-d. 1835) and an unknown slave woman in Giles County, VA. Rhoda was born in 1830 but her death is unknown. Charles Dingess’ uncontested will freed Rhoda Dingess at her 21st birthday. Andrew’s father is unknown. Charles Dingess was the son of Johan Peter Dingess who arrived in Philadelphia, orphaned on the voyage in Philadelphia in 1751 on "The Brothers" from Rotterdam. Peter as he was known settled in Virginia and never saw his sister who also arrived on "The Brothers" in Philadelphia. Peter was born in Mittelburgh Germany, near Mainz in 1738 and died in Virginia in 1809. Peter’s parents, who died on the six-month journey from Rotterdam to Philadelphia, likely of scurvy, were Michele and Gertrude Dingess. He was born in 1712 and her birth was unconfirmed. They both perished on the voyage. Hugh Lawson Bransford Sr (1877-1958) & Evelyn Goode Hilton (1879-1941) are the parents of Hugh Lawson Bransford Jr., their only child. Hugh Sr.’s parents were Sam Bransford born in Glasgow, KY in 1825 and Harriet Cheatham Bowling Bransford born in Springfield, TN in 1834. Sam’s mother was a slave named Little Hanna who had two sons, Matterson, born in 1819, son of the slave owner Thomas Bransford and Sam, whose father was an unknown slave. Little Hanna’s mother, Millie, and Little Hanna were both from the John Bransford II plantation in Buckingham County, Virginia and were bequeathed to Thomas at the death of his father in 1767. Little Hannah was sold to a Franklin Tennessee family and died there in 1872. Sam was sold at the same auction and was sold to Dr. W. F. Pedigo. He married Harriet Cheatham Bowling, a widow and mother of three, in 1864 in Springfield and owned his own barbershop. My maternal grandparents, Hugh Lawson Bransford Jr. (1907-1969) born in Boston, Massachusetts but attended elementary school in East Orange, New Jersey but raised from about 1914 in Havre de Grace, Maryland & Aurora Vernita Dingus (1910-2001) raised in Langston and Taft, Oklahoma, are the parents of Joyce Hilton Bransford. Gordon Henry Byrd, Sr., originally named John Henry Byrd, was born in Crisfield, MD, on the eastern shore of Maryland (Delmarva Peninsula) in 1888 or Edward Travis Byrd (b. 1867-d. abt 1924) and Sallie Anne Jewett (b.1866 – d. abt 1907), also in Somerset County, Maryland. Edward, known as Travis’ parents were Aaron T. Byrd (b.1844-death unknown) and Nancy (maiden name unknown, b. 1846-death unknown). Aaron’s parents were Henry (b.1817-death unknown) and Amelia (maiden name unknown, b.1822- death unknown). All were born in Somerset County in the Brinkley or Lawsonia Districts, which are now Crisfield. Sallie Anne Jewett was the mother of Gordon Henry Byrd and the daughter of K. Jewett and Anna Brittingham. Grandfather Jewett’s first name is unknown and his parents are also unknown, at this time. Anna Brittingham Jewett, Sallie Anne’s mother was the daughter of Sabra Brittingham. Sabra was the wife of Henry Brittingham, born in Somerset County, Maryland. Sabra’s parents are believed to be, either the Croppers or the Samuels of Accomack, VA which is only 15 miles from Somerset County at the Virginia tip of the Delmarva Peninsula which includes Delaware at the north tip, Maryland in the middle and Virginia at the southern tip which coincides with their landside borders. I am inclined to expect that Sabra came from a nearby area because all of the ancestors whose birthplaces are known came from a 30-mile radius of Somerset County and is not confirmed. Henry Brittinghams parent; Rose (b. 1790-death unknown) and Eli (b.1770-death unknown) were also born in the county of Somerset shown on the census of 1850 as free colored people. Sarah Lena Stuart, mother of Earl Wesley Byrd, my father, was born in Augusta County, VA at South River in the foothills of the Shenandoah Mountains. She was raised in Waynesboro, VA, which is near the border of Albemarle County near Charlottesville also called White Hall Station today. Her father was George Washington Stuart who was born in Augusta County VA and Mary Jacintha, called Molly, Jenkins, also born in South River, VA. George was the son of Benjamin and Lucy (Lucinda) Stuart in the Mount Sidney area of Augusta County, VA in 1862. His sisters were Martha, born in 1860 and Sarah, born in 1864. His parents, Benjamin and Lucy were born in the same county in 1816 and 1817, respectively. My father, Earl Wesley Byrd (b. May 24, 1930-) was born in Hackensack (Bergen County), New Jersey, and the last of eight children. His siblings, Emma Gwendolyn, Jean Teresa, Frances Lena, Lyda Grace, Gordon "Buddy" Henry Byrd, Jr., Winifred Omega, and Carlson, two years his senior died at 12-years old from injuries sustained from being hit by a car in 1940. My mother, Joyce Hilton Bransford Byrd, born on January 12, 1932 in Havre de Grace, Maryland was the 2nd child of five born to Hugh Lawson Bransford, Jr. and Aurora Vernita Bransford Dingus. Her siblings are James Edward Bransford, born December 11, 1930, Judith Allegra Bransford Shockley Jeffries Thompson Muhammad, born January 7, 1933, Hugh Lawson Bransford III, born January 28, 1936 and Jean Aurora Bransford Hartzog, born March 27, 1939. Earl Wesley Byrd and Joyce Hilton Bransford Byrd are the parents of Peter Wesley Byrd. Christopher Daniel Miller & Delores Royster are the parents of Debra Lynn Miller. My father-in-law, Christopher Daniel Miller, is the 3rd of seven children of Daniel Miller Sr. and Mamie Phillips both of South Carolina. Chris was born on Christmas day, December 25, 1924 in Orangeburg, South Carolina. His siblings were Henry, born in 1920, Carl, born in 1922, Daniel Jr, known as David, born 1927, Eugenia, known as Jeanie, born in 1929 and Sonny born in 1932. David, Jeanie and Sonny were born in Jersey City, New Jersey and the older children were born in Orangeburg, South Carolina. Daniel, Sr.’s parents, Peter and Selena Miller were born in 1856 and 1857, respectively, and raised their nine children in the town of Middle, South Carolina in Orangeburg County. Their children were Sarah, born in 1876, Alice, born in 1878, Anzora, born in 1880, Henry, born in 1882, Daniel, born in 1884, Laura, born in 1886, Camidy (a daughter), born in 1888, Joseph, born in 1891 and Rivana, born in what appears on the 1900 census, as 1895. The census show’s Milly Miller is living with this family in 1900 and shows a birth in 1825 in South Carolina and indicates that she is the mother. Since Peter Miller’s mother was Lucy, is it possible that Selena’s mother is also named Miller? Peter Miller’s parents were Ned and Lucy Miller who raised their children in Hunter Township (Laurens County), South Carolina. The 1870 federal census indicates that Ned, born in South Carolina was a carpenter and born in 1819. Lucy (maiden name unknown) was born in South Carolina and was born in 1820. Three children are shown in the home, Sinda, born in 1850, Acie, born in 1856 and Peter, at age 12, born in 1858. My father-in-law, Christopher Miller’s mother, Mamie Philips, was the daughter of Eugenia Baxter Philips. I must check further to locate a census with her siblings and father. Mamie Phillips maternal grandparents were Wilson and Mildred Baxter of Middle Township (Orangeburg County), South Carolina. Both parents born in South Carolina, Wilson in 1850 and Mildred (maiden name unknown) was born in 1858. Their children were Dave, born in 1876 and Eugenie, born in 1874. There is a son, John, born in 1868 but is could not have been Mildred’s son for at his birth she was only 10 years old. It is possible that he is a son from Wilson and a previous wife.